I am so happy to be writing this post exactly one year from the day Sierra and Joe joined hearts. I know they are celebrating their love and the closure of their first year together. I am positive I will think about their wedding every year…and this year was no exception, so I just had to blog about them. New Year’s weddings are becoming more popular in the past couple of years. It only makes sense; the majority of the world takes vacation during the Christmas and New Year holidays; family is in from out of town; and it is the most wonderful time of the year. Festive, warm, inviting and celebratory are all words Sierra and Joe used to describe their dream day. We were truly honored to work with such an adorable couple. What I loved most about their day was the sense of community that was prevalent from planning to execution of the day. Sierra & Joe decided to get married in Joe’s hometown of West Point, Nebraska. He has a large family, and they have lived there for generations. I can’t remember New Year’s holidays in Nebraska where there was a -45 degree wind chill. Yes, it can get cold here, but rarely does it get THAT cold during the holiday. Well, December 30th, 2017 was recorded to be the coldest day of the entire year. I think 2017 wanted to leave its mark on our minds forever. And, I have to say, it will live in my mind for as long as I am involved in weddings. When it gets that cold, logistics become essential. Guests need to be watched out for; maids need to have boots to wear under their dresses; sidewalks and stairs need to be shoveled, salted and then re-salted; flowers cannot be exposed to the elements nor can a wedding team’s skin. I must share a big “THANK YOU” to the driver with Elite Party Bus out of Lincoln, Nebraska. 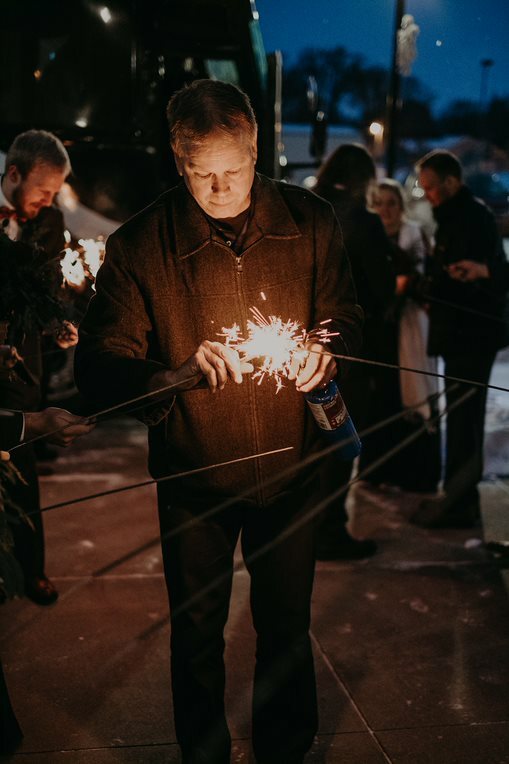 He came thru with a blow torch when we were lighting sparklers for a very, very quick photo opportunity with the wedding party. I don’t think I have ever been so happy to see a blow torch in my entire life. I quickly decided a full-sized blow torch was an essential to any wedding planner’s emergency kit. You can see the images were amazing. And, they were all courtesy of a party-bus driver. Talk about a team effort!! The reception was decorated with beautiful warm lighting that featured a pattern of branches that were replicas of branches featured on the wedding invitation designed by Loree Mayer Designs. Sierra and Joe’s monogram was featured on a wall behind the cake, as well as, cups that sat on a drink wall at the entrance of the venue. Naturally, there was a donut wall, popcorn table, cookies, mini Bundt cakes and wedding cake…talk about my dream come true. I love sweets and they were everywhere on this day…I am proud to say my will power was strong and I didn’t consume any of the tempting calories in front of my eyes all day. Despite the freezing cold temperatures, the day was full of warmth and love. While a blizzard raged outside, the party inside couldn’t have been more full of warmth and feeling of joy and family for these two. I can’t think of a more welcoming group to spend the new year with.